Since 1954, Kent Heating and Air Conditioning has been providing superior indoor comfort solutions, including repair and installation, to residents of Crown Point, Portage IN, and throughout Northwest Indiana. Allen Kent is the second generation owner of the family-owned business, which was founded by his parents, Jim and Norma Kent. 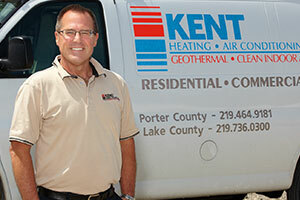 Today, Kent Heating and Air Conditioning employs 17 trained and experienced professionals. We will be the premier supplier of dependable, user-friendly, environmentally-friendly indoor comfort and air quality products and services by delivering extraordinary customer service value every time. To be an industry leader recognized and trusted within Northwest Indiana communities for providing superior HVAC services, exceptional comfort, and innovative solutions by employing highly-trained and motivated personnel. Oftentimes, I have commented to people about how proud I am of our employee team, top-to-bottom. Our people really make the difference. Our commitment to honesty, reliability, and integrity is reflected in our unique ability to communicate proactively with our customers and other team members, and lends itself well to our advanced system design capabilities and product knowledge. The result is the highest level of quality and service for our valued clients because they deserve the very best.